Kanyakumari in Tamil Nadu is one of the top tourist attractions in India as it the confluence of Bay of Bengal, Indian Ocean and Arabian Sea. The sunrise from Bay of Bengal and the sunset in Arabian Sea and the top two attractions of Kanyakumari. It is one of the very few places in India where one can watch sunrise from Bay of Bengal in the east and sunset in the Arabian Sea in the west. Puri in Odisha which is on the east coast is one such place / town where one can watch sunrise from the Bay of Bengal and also sunset in sea (Bay of Bengal). 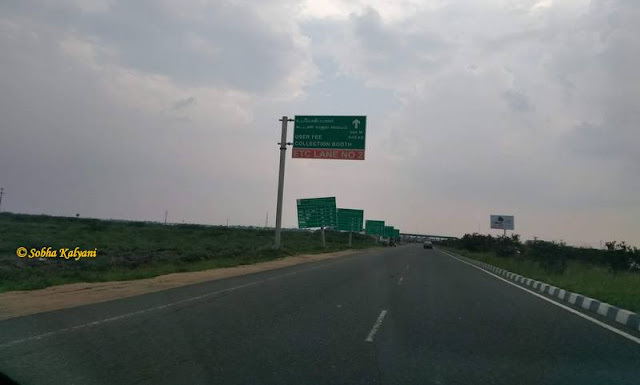 In October 2018 we went on a Tamil Nadu tour. On Day 1 of our tour we visited Kapaaleshwar temple in Mylapore and Parthasarathy in Triplicane, Chennai. 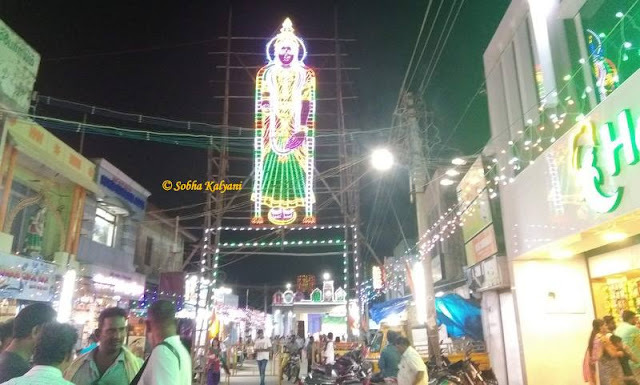 On Day 2 we went on temple tourism to Kanchipuram and visited Varadaraja Perumal temple in Vishnu Kanchi, Kamakshi Amman temple and Ekambareshwarar temple in Shiva Kanchi. 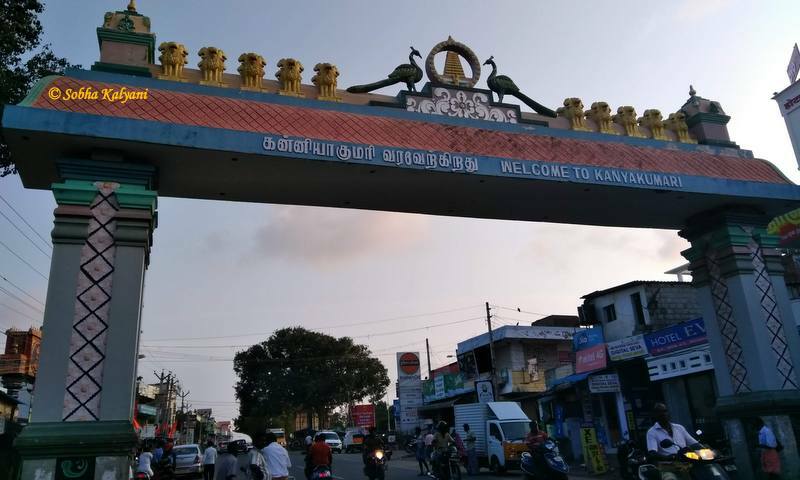 It was Day 4 of our Tamil Nadu tour in October 2018 during Dussehra Navaratri . We checked out the Quality Inn Airport hotel in the morning and took the flight to Madurai and reached the destination within an hour. From this place we booked a cab to Kanyakumar, Rameshwaram (dropped due to time constraint), Thanjavur and back to Madurai. On reaching Madurai we straight away visited to the famous Meenakshi temple and had a quick darshan of the goddess. 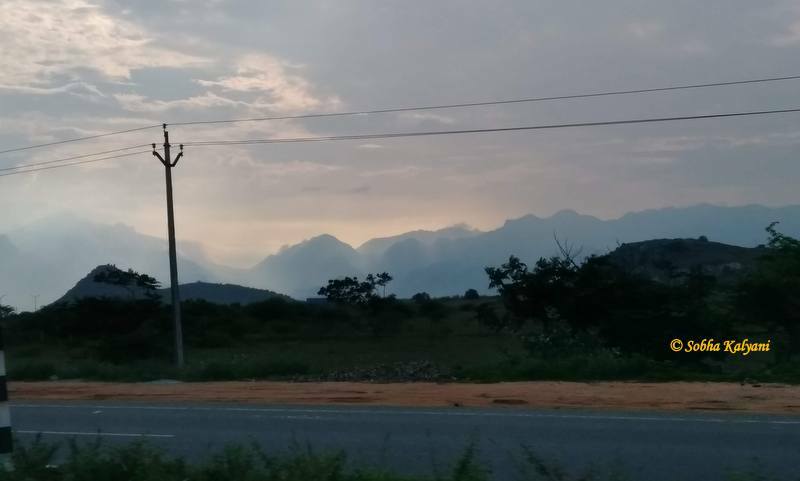 And then we started our road trip to Kanyakumari at around 1 p.m. 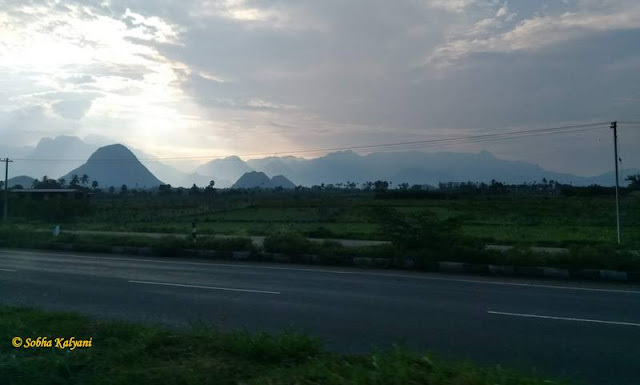 It was a pleasant road trip from Madurai to Kanyakumari on the NH (National Highway) headed straight down to south. There was no much traffic on the highway though it was afternoon time. On the way we could see the beautiful view of hill ranges (I think Cardamom Hills in the Western Ghats. Not sure) from a distance to our right in the west. 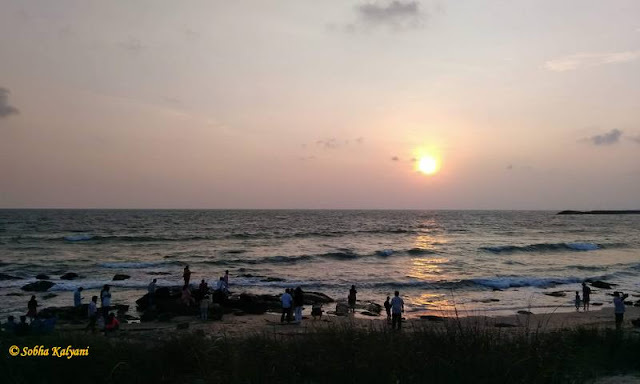 Myself being a nature-lover, I was keen on watching the sunset at Kanyakumari. The driver assured that we can reach Kanyakumari in time i.e before sunset. As I was watching outside clicking pics, I was bit disappointed to see the western sky slowly getting covered with clouds. On the way somewhere near Tirunelveli we came across the windmill farm and there were rows of windmills on either side of the road. I had a strange (mixed) feelings a I could see some atmospheric / climatic change as we were heading to the Southern tip of India's mainland. It was around 5.30 p.m by the time we reached our destination. Kanyakumari is a small and peaceful coastal town in Tamil Nadu. It is the southernmost tip of India's mainland. The name of the city is derived from the local goddess Kanyakumari (a form of Goddess Parvati). The temple of Kanyakumari is located at the Southernmost tip on the shores of Indian Ocean. On reaching Kanyakumari we directly proceeded to the hotel where we booked a room for night stay, as there was still time for sunset. 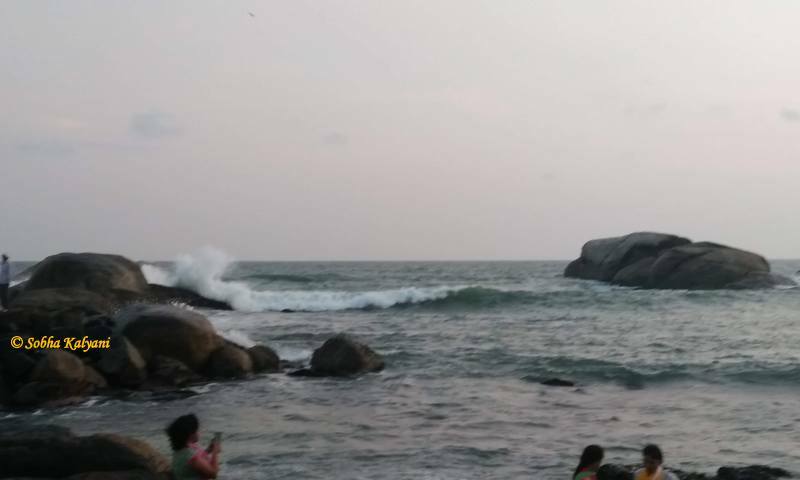 After checking-in we immediately drove to Kovalam Sunset View Point which is at a distance of hardly 5 minutes drive from the hotel. The place was too beautiful with very less tourists. The red Sun was slowly getting down and down. Visitors were enjoying the scenic beauty and eagerly waiting for the Sun to set in the Arabian Sea. 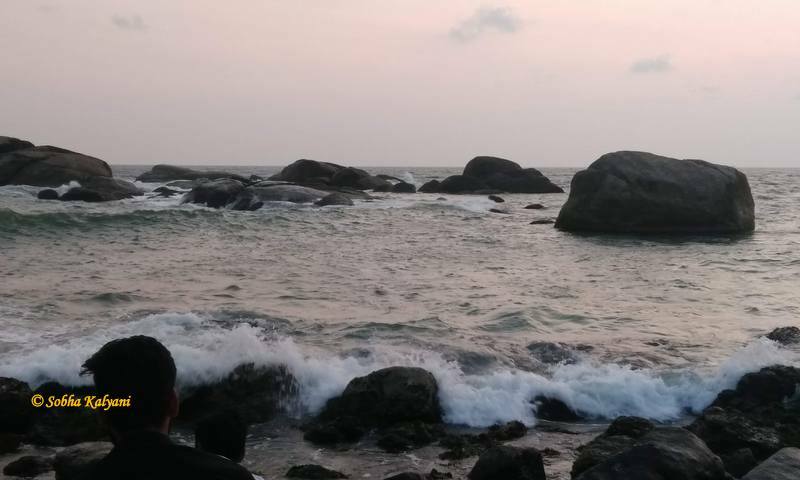 To our left we could see the waves of Indian Ocean moving towards north and splashing on the rocks while the waves of the Arabian Sea moving to the east and dashing the rocky boulders that stand in the sea. That was really a wonderful experience to watch the waves of Indian Ocean and Arabian Sea meeting together. As I was a bit inquisitive I keenly observed for a while and could clearly demarcate the Indian Ocean and the Arabian Sea. After taking few clicks and video shots we were closely watching the Sun to set. And alas! to the disappointment of the visitors the orangish red Sun hid behind the fogs at the horizon. And we felt so unlucky as we couldn't watch the giant fireball setting in the sea. Anyway we spent some time in the peaceful and pristine beach. The fog-covered sky turned reddish orange indicating the sunset. Kovalam Sunset View Point in Kanyakumari is one of the top attractions of the place. In fact this is one of the best view points which provides a breathtaking view of the giant red fireball setting into the sea and the waves of Indian Ocean and Arabian Sea dashing the rocks. The place is not heavily crowded with tourists and so it provides sereneness and calmness. After spending sometime in the shores we visited the Kanyakumari temple to offer our prayers to the local deity. As it was Dussehra Navaratri festive season the entrance of the temple was illuminated with lights. There are rows of shops and hotels on either side of the road heading to the temple. After darshan we went to Hotel Saravana Bhavan and had tasty and crispy masala dosa for dinner. We were then back to our hotel room for a good night sleep. On Day 5 we watched the sunrise from Bay of Bengal and then went to Vivekananda Rock Memorial in the govt-operated ferry, spent a couple of hours in the tranquility. We then checked out of the hotel and headed to Thanjavur. On Day 6 of our tour We made a holy visit to the temples of Brihadeeshwara in Thanjavur, Sri Ranganatha Swamy in Srirangam and Meenakshi in Madurai. And we were back to Hyderabad in the early morning of Day 7. That was one of the most memorable tours to down South India.